At their last General Chapter the Brothers of St John of God endorsed the proposals made by the young members of St John of God and declared 2015 Hospitaller Vocation Year. 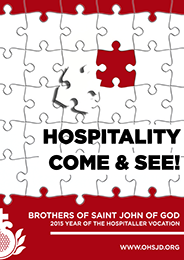 Under the motto "Come and see Hospitality" our intention is to put across more powerfully the vocation to mercy, in all its dimensions, bearing the features of the Hospitaller Brother. Hospitaller Vocation Year will begin on 20 January, 2015 and end on 20 January, 2016, the date on which we commemorate the conversion of Our Father John of God. Our Father General is urging all of us to take part in this initiative, acting in harmony, each one in their own way and through their work, and to experience the joy of our vocation, and of being able to enthuse others with that joy. 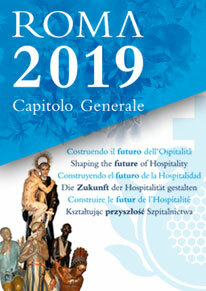 We want the scheduled events and the materials for animation that we have prepared both at the General Curia and in the various Regions to help us feel that we are being called by virtue of our vocation to be sowers of the call to bear witness through our lives, thereby creating a Hospitaller vocational culture among everyone. The members of the Order's General Commission on Vocations Promotion/Pastoral Care and Formation trust that this Vocation Year will inspire us to live our vocation joyfully and to expand the Hospitality culture in the 21st-century. I wish all of you happy Hospitaller Vocation Year.